A management services organization (MSO) is a healthcare specific administrative and management engine that provides a host of administrative and management functions necessary to be successful in the ever changing healthcare environment. As risk begins to shift from health plans to providers as part of managed care arrangements, many of the functions and services traditionally owned by health plans, including clinical outcomes, are now more appropriately owned and operated by the health system itself. A MSO is a gateway to helping providers apply a population health lens to their practice with a focus on quality and outcomes, which ultimately, enable the practice to better control overall medical spend. MSOs, and the functions they provide, come in many shapes and sizes. The governance, structure and functionality of a MSO is unique to the health system it is designed to serve. A health system can design or outsource a MSO for a single function/service or many functions/services depending on their needs. A detailed analysis is necessary to assess market need, organizational readiness, existing infrastructure (including IT), redeployable resources, current vendor contracts and organizational readiness. Other considerations, such as operating in a multi-payor environment, can add to the complexity and require additional assessment and planning. Improved quality and cost: A centralized care management office, as part of a MSO, standardizes care management delivery across the enterprise. Member identification, risk stratification, attribution, care management delivery, care management staffing and population health reporting and analytics are all streamlined with a common governance structure. Centralized performance improvement and quality improvement enables consistent evaluation and course correction across the network. A MSO providing these services is positioned to realize a true opportunity to improve utilization. Economies of scale: Centralization of administrative and management functions across an enterprise increases efficiency and standardizes services while creating an economy of scale on a per member, per month (PMPM) basis. By creating economies of scale, a MSO incentivizes the health system to seek partnerships that will increase membership and reduce PMPM administration costs. Incentive for network expansion: For health systems interested in expanding their provider network, a MSO can be an incentive to attract potential partners. A robust MSO is market-attractive as it enables the provider to focus on providing quality clinical care without the burden of administrative and management functions. Multi-payor managed care arrangements: Health systems that operate in competitive, multi-payor environments can benefit from moving administrative functions away from the health plan and into a MSO. 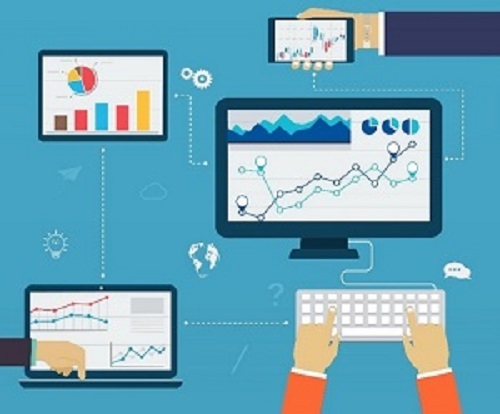 Owning the administrative and management functions enables greater control over medical spend. Additionally, a payor agnostic and firewalled MSO can provide assurances to managed care organizations (MCOs) during contract negotiations and can help maximize the percent of sub-capitation received. As introduced previously, MSOs centralize the administrative and management functions of health systems or practices to leverage resources efficiently and allow providers to focus on providing quality clinical care to patients. MSOs provide a variety of services that physicians or groups of physicians can buy in totality or piecemeal, based on their sophistication and need for the services and expertise a MSO may provide. 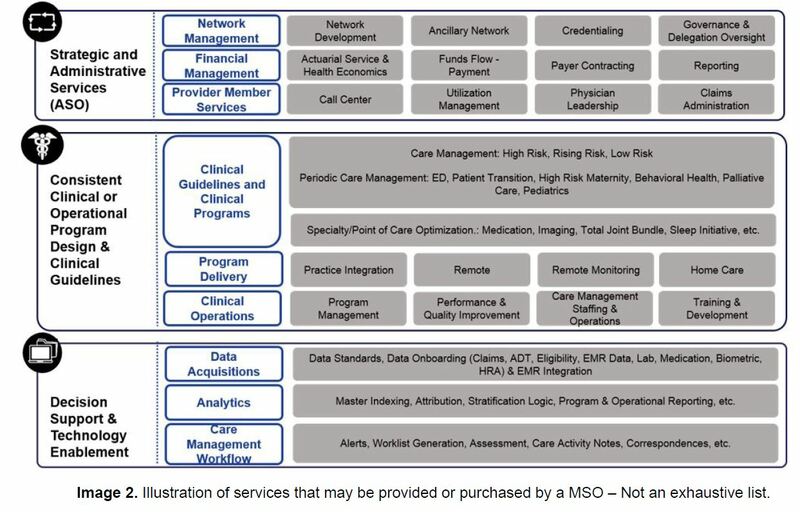 Services typically provided by a MSO can be grouped into three main categories with multiple sub-services within each group, as shown in Image 2 below, 1) Strategic and Administrative Services, 2) Clinical or Operational Program Design and 3) Clinical decision support and Technology Enablement Services. 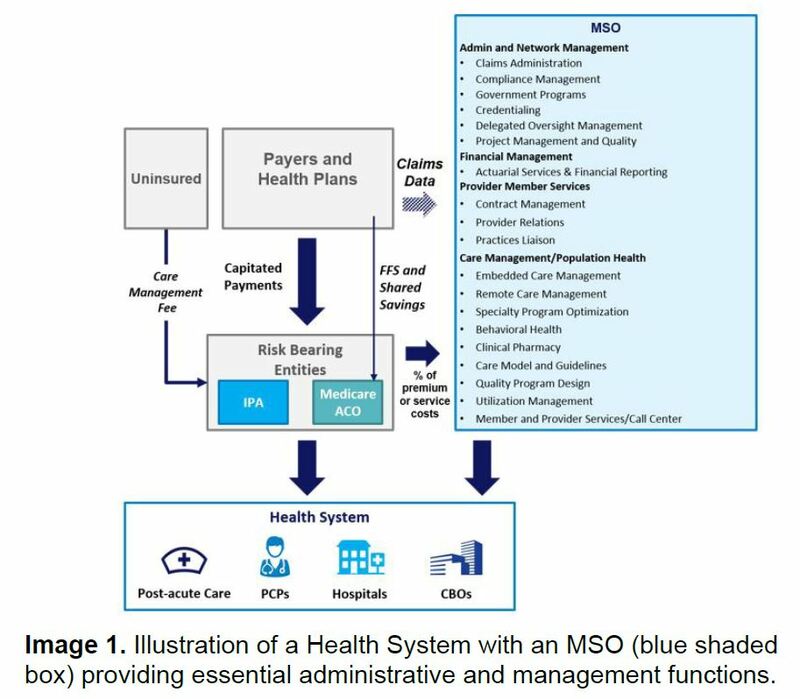 MSOs are not required to provide a specific set or minimum number of services, however MSOs commonly take responsibility for utilization and care management, financial, actuarial and administrative services (i.e. claims management), information systems support, network development and quality reporting and improvement. Centrally managing or prescribing minimum standards for delegation to partners for services like utilization and care management or the provision of clinical guidelines allows MSOs to standardize services across a health system, that may then be able to negotiate for a greater percentage of premium dollars with health plans. MSOs can be built or may evolve from existing health systems or practices already providing many standard MSO services. The decision to build a MSO can be part of a larger strategy to gain market share or increase revenue and/or fill a need for central infrastructure to manage administrative services or population health. There are several key inputs to understand prior to building a MSO and determining what services to build or buy from other MSO providers, including market need and readiness, existing infrastructure available and organizational readiness to scale and provision services to contracted providers. Practices or health systems in need of MSO services typically issue requests for proposals or information to which MSOs respond and bid to be the provider of services. As with any strategic decision or new service, diligent research and planning should be completed prior to building a MSO or deciding to provide MSO services to another entity. Detailed cost modeling to estimate implementation costs, the potential to restructure, scale and redeploy resources and profit and loss estimates should be developed using any claims or expense data available. In addition, effective MSO services for population health and care management may reduce utilization in areas traditionally key to health system or hospital profitability (i.e. inpatient days and admissions). As part of cost modeling efforts, organizations should review estimated revenue potential from providing effective care management services and the organization’s ability to negotiate with MCOs for greater percentages of member premiums, balancing this with the cost of reducing utilization under current fee-for-service reimbursement models. MSOs provide a wide range of administrative and management services to providers that can standardize services across organizations, reduce duplication of services and allow small practices to have access to services it may otherwise be unable to provide. Because of the variety of MSO services that can be offered, it is critical to understand the network need, scope and costs of services prior to building or purchasing MSO services. As health care continues to transition from fee-for-service to value-based payment models, the ability to leverage MSO services to standardize services and manage populations may help both small and large practices succeed. COPE Health Solutions is a national health care consulting firm with expertise in health care systems strategy and population health management for clients across the health care continuum, including hospitals, health systems, physician organization and health plans. Our multidisciplinary team of health care experts provides our clients with the tools, services and advice they need to plan for, design, implement and support successful operations in a challenging and rapidly evolving health care environment. To learn more about our expertise in population health and MSOs, please contact info@copehealthsolutions.com.